Teen Transformers | Features | Kids VT - small people, big ideas! Most high schoolers are ready to bolt after the last class of the day. What would make them stay voluntarily until janitors kicked them out around midnight, night after night? 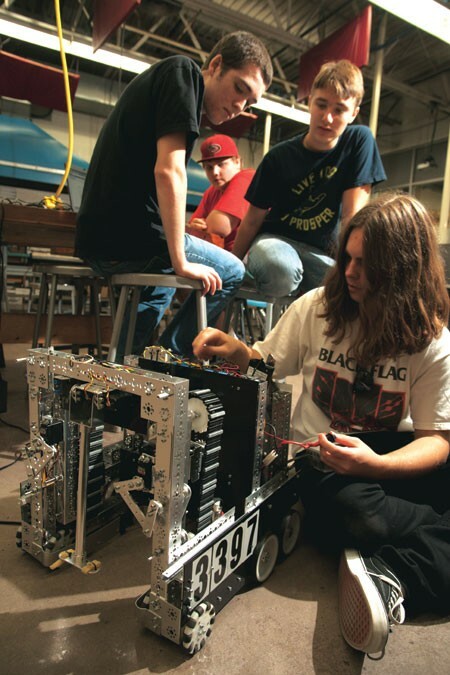 Ask Riley Wilbur and Ian Ballou, both 15 and members of the Essex High School robotics club. Last year, Riley, Ian and their eight Essex teammates put in long hours after school every day building a 'bot, which had to be able to stack crates, pick up raquetballs and roll bowling balls, all while other robots jockeyed around it. The group competes in tournaments organized by a New Hampshire-based nonprofit called For Inspiration and Recognition of Science and Technology, which aims to inspire kids to become innovative, well-rounded leaders through mentor-based robotics programs. Each year, FIRST issues a challenge, and thousands of teams around the world design and build robots to complete it. The Essex kids' efforts paid off. The team earned a spot at the FIRST world championship event, held each year in St. Louis, Missouri. This increasingly popular youth robotics competition doesn't take place in some high school gym; the Essex team put their robot to the test in Edward Jones Dome, home stadium of the St. Louis Rams, packed with more than 100,000 cheering fans. "It was amazing," recalls Ian. If it sounds like an athletic event, well, it kind of is. "That's the way FIRST is going," says Doug Dickey, assistant dean of the University of Vermont's College of Engineering and Mathematical Sciences. "It's going to evolve into a varsity sport." Like other varsity sports, robotics teaches kids invaluable lessons about teamwork, collaboration, and winning and losing with grace. 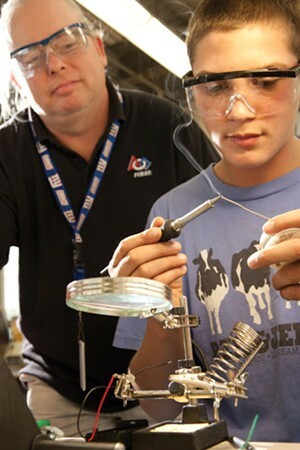 But it also gives them practical technical and problem-solving skills that might someday score them a job. FIRST is an international phenomenon, with a projected 306,000 students participating in competitions this academic year. Robotics fever hasn't quite hit Vermont — but it's about to. This February, the first-ever FIRST Tech Challenge will be held at the University of Vermont, and at least six 10-member teams from around the state plan to participate. If you think engineering is for introverted brainiacs, search for videos from some of these FIRST competitions on YouTube. They're not hard to find. The timed matches are surprisingly dramatic. So are the fans; some teams bring cheerleaders, rally flags and costumed mascots to cheer them on. The action unfolds on Jumbotrons. The big tournaments are like something you'd see on ESPN. Riley's mom, Beth Wilbur, attended the Essex team's qualifying competition in New Hampshire last year. After listening to her son explain what they'd been working on, she thought she had an idea of what she would see. "But when you see it in real life, it's so different," she says. There are obstacles, for one thing, including strategically placed crates — and other robots. "You don't get how much the other robots on the field interact and interfere," she says. "It's chaos, complete chaos, on that field." Dickey saw the Essex team compete in St. Louis. "Watching these kids socialize and show off their skills, it was profoundly infectious," he says. Halfway into that competition, he was smitten. When he returned to Vermont, he got UVM signed on as an affiliated partner with FIRST. Segway inventor Dean Kamen founded FIRST in 1989. Dickey says Kamen felt strongly that kids with an interest in programming and robotics "no longer needed to be the nerds in the basement." Their enthusiasm "should be glorified, it should be celebrated," says Dickey. This mission has struck a chord with companies and government agencies that hope to develop the country's 21st-century workforce; in 2010, NASA awarded FIRST a $20 million grant. 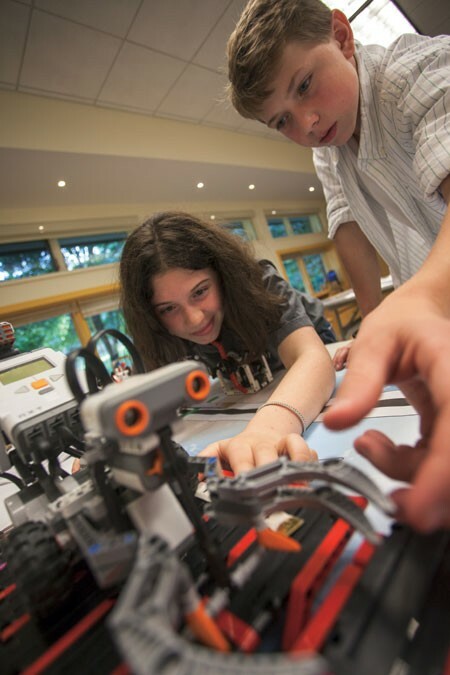 There are four levels of FIRST competitions, from 6- to 9-year-olds solving real-world challenges with LEGOs to advanced high school students building complex, cutting-edge robots. Teams don't have to be affiliated with a school; the Montshire Museum of Science in Norwich has a LEGO League team (see sidebar), as do 4-H clubs, Boy Scouts and groups of homeschooled kids. But they must include 10 members and a mentor — "the incredibly hardworking, over-qualified people who are passionate about helping kids," says Dickey. FIRST teams also recruit local companies to sponsor them. Last year, the Essex team got to use the facilities of Greensea Systems, a Richmond-based engineering firm that develops underwater, unmanned vehicles. The Greensea staff helped them prepare to compete in St. Louis. The Essex High School robotics team has been around for about a decade, thanks to veteran science teacher Joe Chase, who is on the planning committee for the Vermont FIRST Tech Challenge Championship. His team has competed in FIRST competitions every year, though last year was the first time they made it to the championship round. According to Chase, teaching robotics in schools is still "very rare." But he also notes that what he and his kids do in robotics club isn't that different from what kids have been doing in traditional carpentry and mechanics classes for generations: building stuff. "Robotics is just a natural extension of that," he says. It's an extension made possible by the incredibly high-tech tools that schools can now put in kids' hands — Essex's brand-new "fablab" is equipped with a 3-D printer, among other awe-inspiring machines. "Before, the tools [one would use in robotics] were fairly inaccessible," says Chase. These days, technology is "smaller, cheaper and modular, so you don't have to make everything from scratch." And FIRST robotics competitions aren't just about science and engineering, notes Saint Michael's College physics professor Alain Brizard, also on the Tech Challenge planning committee. These teams are solving problems first, building a robot second. "Not everybody on the team will fit the same mold," says Brizard. "We will need writers, artists, painters, as well as engineers, to put everything together. It's a very exciting concept." Collaboration is key — not just within robotics teams, but across teams, too. Each match of a FIRST competition involves four to six different teams, and their various robots, split into two "alliances," competing against one another. "Your opponent one match could be your collaborator the next," says Brizard. Which is why each team often includes a "scout," whose job is to scope out the strengths and weaknesses of other teams in the competition. "In engineering, it's always, do you want to be fast or do you want to be strong?" says Kristin Winer, an Essex Junction-based engineer on the planning committee. "You can't be everything to everybody. So, you kind of pick where your skill set is and where you think you'll score the most points." Teams want to score points and win, of course, but the competition, says Chase, is surprisingly civil. "You'll never hear any booing at these competitions, because students marvel at other students' accomplishments," he says. And parents and coaches are forbidden from approaching judges or referees, so if kids are upset about something, they have to deal with it on their own. "They have to go to the referee and say, 'I didn't agree with that, and this is why,'" says Winer. "It really does empower them." Last year, the Essex kids made it to the world championship not because of their robot's performance, but because of their overall creativity and the eloquence with which they presented their strategy to judges at the qualifying competition in New Hampshire. "Our robot didn't perform very well," admits Ian Ballou. "But in our interview with the judges, they really liked how we worked together as a team." That earned them FIRST's top prize, the Inspire Award, given to the team that best embodies the spirit of the competition. They're hoping to make it back this year, but even if they don't, Ian and Riley appreciate the small wins, too. "Just seeing [the robot] work is awesome," says Riley. "If you have a success with building a robot," adds Ian, "even if it's just a small one, it feels really good." The Vermont FIRST Tech Challenge Championship Tournament is Saturday, February 23, at the University of Vermont Davis Center. Info, usfirst.org. Members of the Essex High School robotics club will be at the Vermont Tech Jam on October 26 and 27 at the Champlain Mill in Winooski. They'll talk about how to start a robotics club, and discuss their journey to the FIRST world championships on Friday, October 26, at 10:30 a.m. School groups are welcome that day from 10 a.m. until 2 p.m. On Saturday, club members will be selling refreshments from 10 a.m. to 3 p.m. to raise funds for their upcoming tournaments. RSVP at bit.ly/tech-jam-2012-field-trip-RSVP. Admission is free. It's never too early to encourage kids' budding interest in robotics. At the Montshire Museum of Science, a team of 9- to 14-year-olds is building a robot out of LEGOs. If all goes well, they'll debut the creation in November at a regional FIRST robotics competition at the Thayer School of Engineering at Dartmouth. Aaron Lamperti, an exhibits technician at the museum, says he didn't need to advertise to round up 10 area kids for the FIRST LEGO League team he's coaching. Both of his daughters, 9 and 13, are on the team. After taking computer-programming classes at school, they're familiar with animating characters with basic graphic programs, so switching to LEGO robots isn't a stretch. Like most tech-savvy kids these days, says Lamperti, "They're primed to do it." Anticipating that his robotics club would attract mostly boys, Lamperti asked his daughters to recruit their girlfriends. Mission accomplished. "These girls are not at all saying, 'That's not for me; that's a boy thing. They're just sort of technically minded kids interested in building stuff." The Montshire team is one of more than 20,000 teams participating in this year's LEGO League around the world. Each has the same intriguing challenge: Research a technical problem that people encounter as they age, then design a LEGO robot that can accomplish small tasks related to that problem. At the competition, they'll be asked to give a presentation on their research and to solve a new problem on the spot, such as building a bridge out of toothpicks and marshmallows. "The judges will watch them to see how they communicate, how they solve problems," says Lamperti. As a dad, Lamperti says he's noticed a cultural shift in how kids who geek out on computers and code are perceived by their peers — and how they perceive themselves. "My older daughter considers herself to be a nerd," he says. "That's her thing, that's her crowd. She loves to meet people who are into the things she's into. That's a big change."